Very nice glass and heavy feel. Two lights and pull chain is classic. The stem, though, has a bit of a cheap resin look, not consistent quality with the glass. This 2-light tiffany syle Victorian/baroque design table lamp features a dark bronze finish. Hand crafted from inidvidually cut pieces of art glass and will add color and beauty to any room. Main colors green, beige and amber. I purchased 2 of these for my Great Room that needed some accent table lamps. Although I have Tiffany lamps that cost three times as much, these fit in and add nicely to the ambiance of the room.. The browns, greens, subtle creamy orange-red and swirled cream glass is beautiful when lit. I am thrilled with them but want to point out that upon close inspection the leading does not look like the $300 lamps but it does not take away from their beauty. I could not have made a better choice to complete the look of this gathering room. Although you can use much higher wattage bulbs if you are looking to have them as your only light source, the colors are more vivid and beautiful with a couple of 40 or 50 watt bulbs. These are definitely keepers and add grace and finish. They do not weigh down the room and could fit into any décor. The set up is easy, only taking minutes, and the instructions clear. After the lamps were in place my husband came into the room and said "How Elegant! "These were exactly what we needed! Great quality and craftsmanship; beautiful, rich colors in the shade. The value for the price was excellent. This is a great addition to my library. I would definitely recommend this tiffany style lamp. Darcy C.
Lamp came today. I was so worried about the reviews saying it was plastic. 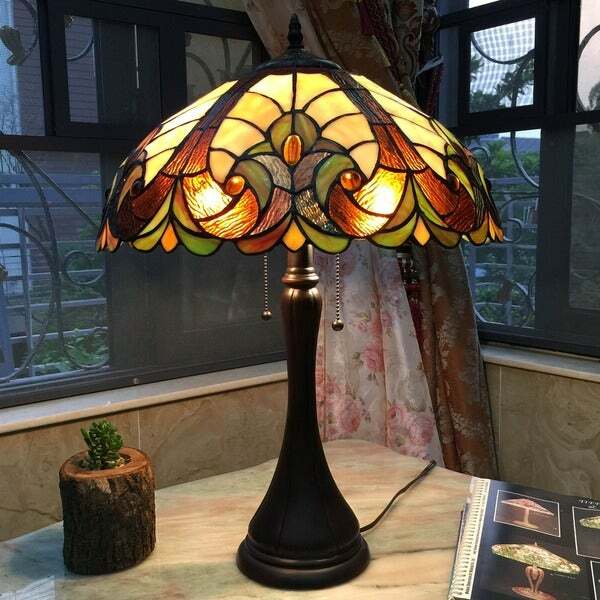 It is stained glass shade with a resin base that you could call plastic, but it is pretty. I have overhead stained glass fixtures by Quoizel and this lamp matched perfectly. Let me be clear. The shade is stained glass. Some of the reviews seemed to state that the shade is plastic. it is not plastic. Anyway, beautiful lamp and blends in well with my overheads and floor lamp. Same colors that I saw on my monitor. Very satisfied! Especially for the price!!!! Bought this lamp for my grandson who has just rented a condo and is trying to furnish it. He is 28 years old and a hard-working guy but does not have time to really shop like he wants. He LOVES my tiffany-style lamps and everytime he comes to my house he has to "visit" everyone of them and tell me how special they are. I got this lamp for his birthday and when he opened it he was amazed with its beautiful design and colors. I know he will love it as his first Tiffany-style and I am so glad I was able to give him his first at such a reasonable price. It's a keeper for sure. Also, it was packaged very carefully and was in prefect condition, even though it was raining very hard when the UPS man came. So glad I can get quality merchandise at a reasonable price from Overstock! I love my new Tiffany-style lamp. It is absolutely gorgeous. I love my lamps!!!!!!!!!!!! I have the whole collection. All the matching pieces. They are so beautiful!!!! Im totally OBSESS with these lamps!!!!!!! This lamp is beautiful. I love it! Would recommend. Meets most expectations and like the ability to use one or two lights. Colors are beautiful and adds a nice ambiance to the room. I was very disappointed when my lamp arrived, the first thing I noticed is how lite the box was. While putting the lamp together I noticed a broken lens.... They are plastic! Not glass as described. This lamp is not worth that kind of money!! Very disappointed! Going to return this item. Dont like detailing. Too chinchy looking and it feels like plastic. Ordered two of these lamps for bedroom nightstands. Both arrived in great shape and we are very pleased with how they look. Size and color match exactly as advertised. I really like this lamp, it's beautiful! I love the neutral colors and if you are on the fence, I would definitely recommend purchasing it. I was able to get it on sale and the price was worth it. Also, the packaging was very good, I am keeping it so that when we move it will be safely packed until we get to our new home. It is so beautiful and Im planning on ordering anothering one. I love it. The colors are perfect. It adds just the tight amount of light and ambience. I would recommend it to everyone. The lamp was even nicer than expected once it arrived. Easy to assemble. Would like to order another one in blue. "Does anyone have the exact measurement of the base width?" The width of the base is 6 inches. "Can you use florescent bulbs? I have other stained glass lamps. the florescent bulbs make lamp look brighter and glass prettier." Yes, you can use Incandescent, LED and Compact Fluorescent (CFL) bulbs. "I have asked this question on another lamp, but I see this is a bit smaller and might work better for the table. So again, can anyone tell me if this lamp has blue glass pieces and if so is it there a lot of it or just a little?" "Is the shade glass or plastic. I see reviews that state it is plastic, but the description states that it is glass." Will work well in my living room. This is a gift and the recipient loves the Tiffany style of lamp. I hope this will be as good as the picture and will make recipient happy and she will love it. "Is the base bronze metal or resin? If resin - what type? Also, 100w bulb is listed - is this light able to handle a three way light bulb up to 100w?" Hi Reference #: 140423-004033, the base is made of resin with a bronze finish and each bulb can be up to 100W max. I hope this helps, thanks for shopping with us. "Is this a leaded glass shade or just glass or other?" Hello kayroc, This lamp is beautiful! This item is dry UL rating. I hope this information helps. Thanks for shopping with us. Hello kayroc, Also, the shade is made of just glass. I hope this information helps. Thanks for shopping with us.